In preparing for the Halloween season I set off to discover some horror flicks I hadn’t seen that featured or were set during my favorite holiday season. This is how I stumbled across The Hollow, a 2004 straight-to-video flick that stars Backstreet Boy-bander Nick Carter. OK Hollow, that’s already one strike against you, so I hope you can redeem yourself from that unfortunate casting decision! This teen slasher is based on the classic Washington Irving tale, The Legend of Sleepy Hollow. In the film, high schooler Ian Cranston (Kevin Zegers) is new to the town of Sleepy Hollow. He arrives in town around Halloween and quickly joins into the town festivities. The town holds the Headless Horseman legend pretty dear to its heart, so there are plenty of Halloween festivities to celebrate Irving’s creation. To some, however, the legend is all too real…and soon enough, heads start to roll. It turns out that Ian is a descendant of Ichabod Crane and is the only one who can stop the Headless Horseman’s return to Sleepy Hollow. You know, I was pleasantly surprised at how entertaining The Hollow actually was. It will certainly never win an Oscar and its mostly a forgotten flick, but I’m glad I gave it a looksie. 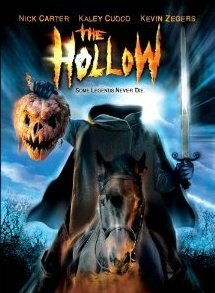 I’m a sucker for anything involving The Legend of Sleepy Hollow, so I think that plus the festive setting of Halloween really sold the film for me. Yes, it’s a pretty linear story and the few subplots don’t really work (one involving Ian butting heads with his football coach dad, played by none other than Judge Reinhold; another involving Ian hooking up with the lead cheerleader and her boyfriend, played by Nick Carter, getting steamed), but I enjoyed the main story of the Headless Horseman and Ian’s ancestral link to Ichabod Crane (revealed to him by none other than Stacy Keach, really selling his role as the grungy cemetery caretaker). The story certainly isn’t complex, but nonetheless I enjoyed it. However, there are several negatives to this flick I feel I must address. First of all, I enjoyed how the film was set during Halloween and had people dressed and costume and decorations, but I really felt MORE should have been done to capture the feel of Halloween. The visuals just needed more pumpkins, more orange and black and more decorations! Especially since the town took the holiday so seriously! Secondly, the pacing is a bit slow and the Headless Horseman doesn’t make an appearance until half-way through the flick. And when he does appear he has a silly pumpkin for a head that’s just laughable! I wish they would have kept him a bit more in the shadows and hidden the hideous (not in a good way) costume. Third, WTF is Nick Carter doing acting?! His “white boy trying to do gangsta” persona is just annoying and embarrassing. Really, who in their right mind would cast him? I understand if he had his head lopped off early, but unfortunately he is in the film ’til the bitter end…and we are never treated to his death!! WTF is up with that? He was supposed to be like Paris Hilton in House of Wax...the whole point in watching was to see him meet a gory end, but that’s just not in the cards in The Hollow. Speaking of gore, the film really has none. The heads that the Headless Horseman collects look fake, though the decapitation scenes (usually shown from afar) look pretty good. There’s not that much bloodshed here, but overall this didn’t detract too much from my enjoyment of the film. The Hollow definitely has its problems, but despite these I found the flick to be an enjoyable (though not entirely memorable) time-waster. If you are looking for a mindless flick to get into the Halloween mood but have worn out your Halloween and Trick ‘r Treat DVDs, The Hollow isn’t a terrible choice. It wasn't a "straight to video" movie. It was made for TV--ABC Family channel I believe and played during their 12 Nights of Halloween series for a couple of years. Only after that was it released to video. Good movie? No. Nice concept, but the lack of money put into the movie shows. Even the veteran actors stank-Stacy Keach, and the guy that plays the father were dreadful. Eileen Brennen at least can blame being poststroke for her lack of "stage" presence. Honestly, Nick Carter was about the best performer there--that should say it all. Hmmm I didn't know it was a made-for-TV movie but I guess that explains all the weird edits. This wasn't a "good" movie, but for some reason I still enjoyed it. I thought Keach was pretty hilarious but really couldn't stand Carter's "white-boy-gangsta" routine. I expected A LOT worse, so despite its low budget and annoying actors, I actually had a lot of fun with this flick. I like the cover anyway...haven't seen the flick though!